Last year we ran a feature on MESH (Make, Experience, SHare) – a smart DIY platform to make creation of “smart inventions” accessible for everyone. Today, MESH project reaches a milestone – we’re pleased to announce that the first edition of MESH is available for purchase in the United States through Amazon following the launch in Japan. MESH is made up of two key elements: “MESH Canvas”, an intuitive app that enables you to easily define tasks without complex coding and wireless “MESH Tags” with different functions. 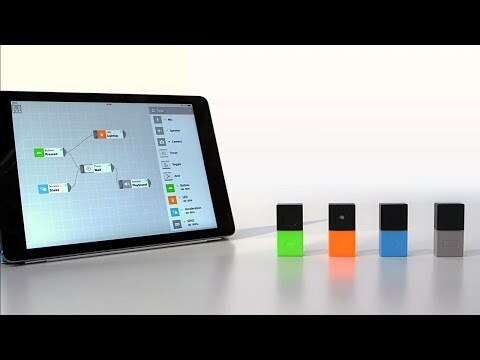 MESH Tags talk to each other through MESH Canvas, with connections easily configured through the app – current functions include: Move (movement sensor), Button, LED and GPIO (general purpose input / output). It’s really only the beginning, as the project will continue to evolve together with users and the developer community to expand both the range and capability of Tags over time. Imagine having your plants watered automatically, an LED on your door that turns on every time rain is imminent… or even a little fun adding dramatic sound effects to board games, or finding a trash can that says “thank you!” every time you throw rubbish away. We can’t wait to see what people create. MESH was on show at the Maker Faire Bay Area event in San Mateo in May, bringing the story full circle after the first unveiling this time last year. It’s been quite a journey over the past twelve months – the project has been through a process of testing and trials, eventually crowdfunding MESH through Indiegogo, but more importantly, to communicate with the early adopter community as the project moved on from prototyping to commercialisation. The project team also showcased MESH at Eureka Park during CES 2015, and following that, MESH featured at Hacker Dojo (a forum for all things innovation in the heart of California), SXSW and more meet-ups. MESH is part of our new business creation initiative, Sony’s “Seed Acceleration Program” – an incubator designed to have startup-style agility and fleet of foot, to bring some of the more progressive, creative and niche ideas within our Sony community to developers and consumers quickly and easily. As part of Sony Mobile’s operations in the United States, we recently established a new sales office, “US sales office of Seed Acceleration Program LLC” in San Mateo to bring products and services from Sony’s Seed Acceleration Program to market – MESH is the first offering from this new company. Our President and CEO Hiroki Totoki spoke at Mobile World Congress that part of his vision for Sony Mobile, is not just looking at ways we can improve our core Xperia smartphone business, but also how we develop emergent technologies, co-creation opportunities to enhance “entrepreneurship” within a large corporation, as a launch pad for new startups. But not all of our innovation happens as a direct result of this process. Innovation is a company-wide focus and all our employees are encouraged to contribute and think creatively as part of their day-to-day life at Sony – our Seed Acceleration Program will encourage us to act and think with the tenacity and bravery of a new venture, but most importantly, ensure you see and experience things you never thought possible before. It’s an exciting time, and we’re only just getting started. Want to know more? A full press kit is available here.